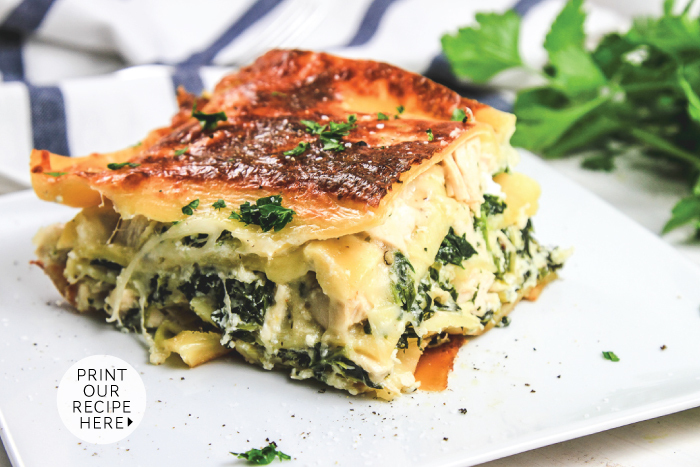 This White Chicken Lasagna is loaded with chicken and cheese-y layers of ricotta, parmesan, and spinach. This recipe comes together rather easily by using time-saving, oven ready, no-boil noodles. So delicious! 1. In a saucepan, cover the chicken breasts with water and boil until the chicken is cooked thoroughly (165 degrees F at the thickest part), about 10-15 minutes. Let the cooked chicken cool, then dice into 1/4-inch cubes. 2. Make the sauce. In a saucepan, melt the butter and whisk in the flour and stir until smooth -- at least 2 minutes to allow the flour to cook. Add the chicken broth and sherry, and stir until sauce is combined and slightly thickened. Season the sauce with the oregano, salt, and pepper. Add the diced chicken to the sauce and stir to coat. 3. Prepare the ricotta layer. Mix together the parmesan and ricotta cheese. Thaw out the frozen spinach, and squeeze it until it is well-drained. Stir in the thawed and drained spinach into the cheese mixture. Season with salt and pepper. 4. Assemble the lasagna. Add a drizzle of olive oil to the bottom of a large casserole pan. Layer the noodles on top of the olive oil. Add a layer of the ricotta mixture on top of the noodles, then add a layer of the chicken mixture. Top the chicken with a sprinkle of cheese, then add another noodle layer. Repeat the layers until you reach within 1/2” of the top of the pan. Finish the layering process with a noodle layer generously covered with mozzarella cheese. 5. Loosely tent the lasagna with aluminum foil. 6. Preheat the oven to 350 degrees F. Bake for 50-60 minutes, or until the lasagna is hot and bubbly. Remove the aluminum foil from the top for the last 10-15 minutes. If needed, broil until the cheese to golden brown perfection. 7. Let the lasagna sit for about 10-15 minutes after removing it from the oven to allow the layers to set. Garnish with fresh parsley and serve hot.